In quintet or quartet, embark on a joyous musical journey of different music styles with saxophonists of these two outstanding ensembles coming from Europe and North and South America. FIVE SAX is a modern-style saxophone quintet featuring fve musicians from around the world. The individual members of FIVE SAX are all established solo musicians, who represent a signifcant international presence and hold many prizes from important national and international competitions. The members converged in Vienna from around the world, united by a modern conception of virtuosity and the constant urge to push the limits of performance. The fve musicians from Poland, Italy, Belgium, the USA and Chile each brings his own unique and vibrant personality to the group. The ensemble’s imaginative programming mirrors the diversity of its members; rooted in classical music, while venturing into American jazz, south-American Latin styles and European folk music. The ensemble began in an unusual way: performing street theater in the center of Vienna. Their frst year performing together was an unforgettable experience of running from the police, surviving freezing temperatures and dealing with angry shopkeepers. The ensemble’s past is echoed in their concerts by their use of theatrical elements, their strong connection with the audience, and their spontaneous approach to making music. 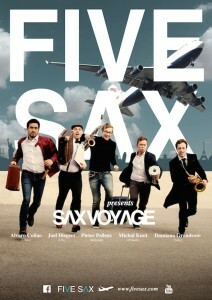 FIVE SAX invites you to join them on an unforgettable musical journey. The multi-continental trip begins in the legendary capital of music: Vienna, with a look back at some timeless classics of the past. Then we jump on a train to explore the rich ethnic musical styles of Spain, Italy, Hungary and the Balkans. From there we hop on a fight to Rio de Janeiro to experience the seductive rhythms of Brazilian Bossa Nova, the passion of Argentine Tango and a visit to the mythic Columbian town of Macondo. For the last stop of our voyage, we touch down in sunny Los Angeles where we rediscover some of the most famous Hollywood hits.